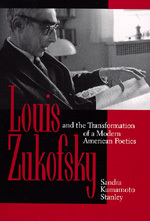 Viewing Louis Zukofsky as a reader, writer, and innovator of twentieth-century poetry, Sandra Stanley argues that his works serve as a crucial link between American modernism and post- modernism. Like Ezra Pound, Zukofsky saw himself as a participant in the transformation of a modern American poetics; but unlike Pound, Zukofsky, the ghetto-born son of an immigrant Russian Jew, was keenly aware of his marginal position in society. Championing the importance of the little words, such as a and the, Zukofsky effected his own proletarian "revolution of the word." Stanley explains how Zukofsky emphasized the materiality of language, refusing to reduce it to a commodity controlled by an "authorial/authoritarian" self. She also describes his legacy to contemporary poets, particularly such Language poets as Ron Silliman and Charles Bernstein. Sandra Kumamoto Stanley is Assistant Professor of English at California State University, Northridge.